AMD is hosting a press conference at Computex, likely to be related to 2nd Generation Ryzen processors. According to the latest roadmap AMD still plans to launch Ryzen PRO Mobile processors in this quarter. The desktop variants of PRO series and 2nd Generation Ryzen Threadripper are both to be expected in the second half of this year. 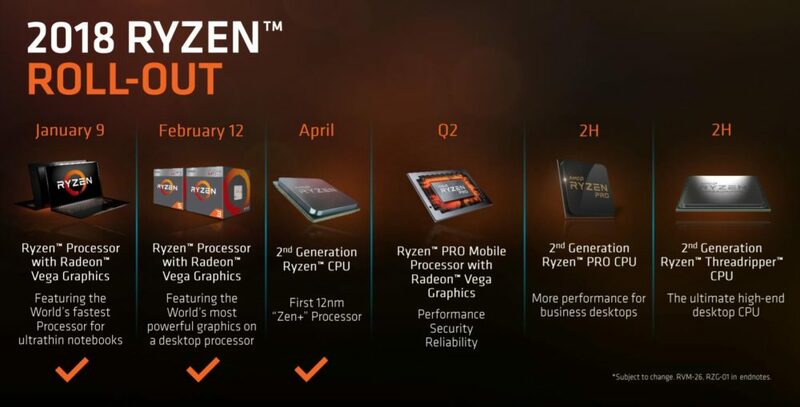 The conference could also be related to unreleased Ryzen 3 processors and also new Ryzen mobile SKUs. Dr. Lisa Su will be joined by other AMD executives during the conference. It could be the first time new RTG management would share details about the future of Radeon group, or so we hope. Please join us at the AMD COMPUTEX 2018 press conference on June 6th starting at 10 a.m. at The Westin Taipei. We look forward to sharing updates on AMD products and technologies, presented by AMD President and CEO Dr. Lisa Su, alongside other senior AMD executives and our partners. Already in 2018, AMD delivered multiple new leadership products including 2nd generation AMD Ryzen desktop processors, generating significant customer and market enthusiasm. Ryzen and Radeon are again the brands to watch at COMPUTEX 2018, and we look forward to sharing new details with you at our press conference, showcasing AMD high performance leadership and innovation. Please click here to register for the event and you will receive a confirmation e-mail once the registration form has been processed. We look forward to seeing you at the AMD COMPUTEX 2018 Press Conference!